Now a days, most people shoot video either on their phones or digital still cameras. If you’re using the latter, you may notice some shakiness caused by the CMOS sensor found in most consumer digital cameras. iMovie ’11 can help you alleviate the teetering and tottering via the Inspector menu. 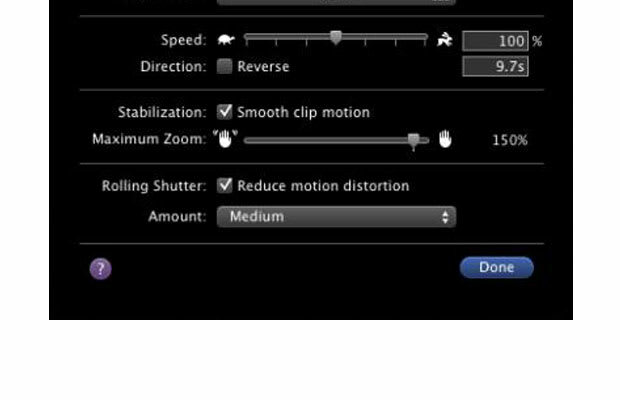 After the clip is finished being analyzed, go under the “Amount” menu and pick the level of distortion reduction you need. If you’re using your phone or a digital camera, Apple recommends you use “High” or “Extra High”.